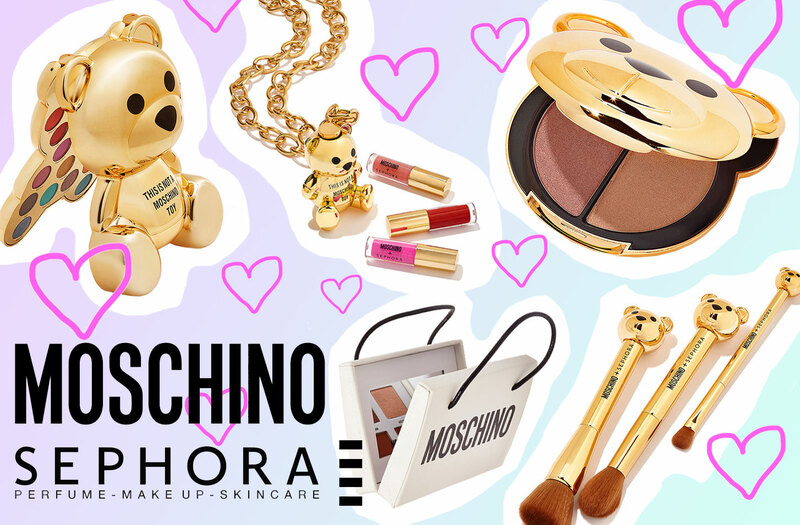 Beauty News: Sephora X Moschino Golden Teddy Collection! A ‘This is not a Moschino toy’ Bear Eyeshadow Palette ($60.00) – this palette is said to be LARGE! A Bear Brush Set ($68.00) – including five brushes with bear heads. A Bear Head Highlighter Palette ($28.00) – including two highlighter shades. A Bear Lip Gloss Chain Necklace ($40.00) – including six lip glosses. Other items in the collection include a Bear Eye Mask ($25.00) made of super-soft faux fur, as well as a Bear Compact Mirror ($28.00). The whole range features the iconic Moschino teddy bear, and each product also has a striking high shine gold finish. I learned very early on how much young people love my work, and sometimes they don’t have the means to get it. This is another way for me to do Moschino and not sacrifice quality. It’s a lot more accessible. I love to be able to put my arms around more people and have them be a part of the Moschino family in some capacity. From what I can see, the collection will be available at Sephora in August, I’ll update this post as soon as I know the exact release dates. Seriously though, just looking at this packaging makes me HAPPY!